All the investment that has been flooding into fuel cells, renewables and grid storage is hastening the day when electric planes take to the runway — a moment that is coming sooner than many realize. This summer saw some of the hottest temperatures ever recorded, which served as a wake-up call to much of the world’s population. We are no longer debating whether climate change is happening but rather how to deal with it. At this week’s Global Climate Action Summit in San Francisco, global leaders from government, business and civil society will meet to find the most viable solutions to address the rapidly changing environment, and I believe serious commitments will be made to address climate change. In advance of the summit, the Zero Emission Vehicle Challenge was launched, which will see states, regions, cities and international business use their purchasing and policy influence to accelerate the adoption of electric vehicles around the world. The massive conversion underway to electric vehicles is still in its early phases, but I believe that the Challenge alliance will make a material difference toward accelerating electric vehicle adoption. However, I see another opportunity to reduce transportation emissions, an opportunity in our skies. Airplane emissions have grown by an average of 4.3 percent annually since 1999 and are projected to take up nearly 25 percent of the world’s carbon emissions by 2050. As the jet engine drove a 50-year shift away from regional air service and toward a hub-and-spoke system, it created inefficiencies and cut off regional communities, while producing massive amounts of emissions. What could possibly turn this scenario around? Electrification. All the investment that has been flooding into fuel cells, renewables and grid storage is hastening the day when electric planes take to the runway — a moment that is coming sooner than many realize. 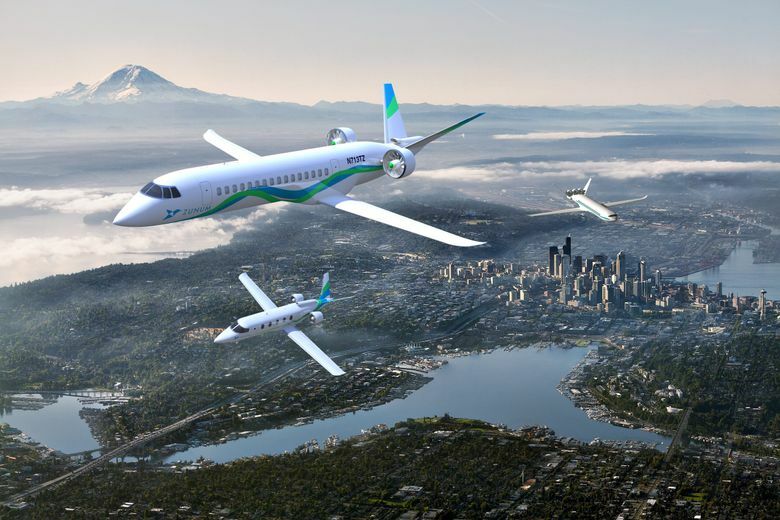 Aviation is on the cusp of realizing the potential for electric-powered aircraft, from air taxis and commuter vertical takeoff and landing vehicles to regional planes traveling out to 1,000 miles. By shifting sub-1,000 mile trips away from fossil fuels, we could eliminate all emissions over these ranges by 2040. The effects of electric aircraft will be profound. While flying has declined to only a minuscule share of our travel within the 1,000-mile range, flights up to that distance represent 40 percent of all aviation emissions. In addition, our studies have shown that replacing long highway journeys with electric aircraft would reduce overall transportation emissions by a further 4 to 8 percent. And, as a bonus, our thousands of underutilized regional and community airports will light up once again with streams of electric aircraft, reducing regional travel times by a half to a quarter and transforming long drives into short flights. While market forces and technological change are already making the switch to electric flight inevitable, the U.S. can — and should — aim for an even bigger prize. With its incomparable network of metropolitan and community airports, this country could emerge as the undisputed global leader in low-emission regional flight — at precisely the moment when global demand for this capability is about to achieve takeoff. Here, in Washington, change is already afoot. Our state leaders recently formed a multidisciplinary electric aircraft working group that is led by the Washington State Department of Transportation Aviation Division, which includes state representatives, airports, electric-aviation experts, airline operators and manufacturers. The group’s findings will be reported back in June 2019, and goals include reviewing the current electric aircraft industry and determining needs related to infrastructure for electric aircraft within the state. However, to achieve maximum impact, we need a national agenda defining a path forward — much as Norway has done with its commitment to shift all short-haul flights to fully electric aircraft by 2040. The time is now for America to lift its eyes to the horizon and revive its dream of regional air travel accessible to all. Ashish Kumar is founder and chief executive officer of Zunum Aero, an electric aviation company based in Bothell. Zunum Aero has received funding from JetBlue Technology Ventures, Boeing HorizonX and the state of Washington’s Clean Energy Fund.